Intrigued, I read further and was sold by the tagline: “… a historical revenge tragedy and courtroom drama set in mid-nineteenth-century Scotland.” I like historical fiction and I enjoy reading about Scotland (*cough* Diana Gabaldon *cough*), so I thought I’d give it a shot. Once I realized it was framed as a tell-all-memoir and case trial, I was hooked. I do love a good crime drama (seriously, you should see my Netflix right now—Luther, Midsomer Murders, Law & Order: SVU, X-Files, Gotham). A brutal triple murder in a remote Scottish farming community in 1869 leads to the arrest of seventeen-year-old Roderick Macrae. There is no question that Macrae committed this terrible act. What would lead such a shy and intelligent boy down this bloody path? And will he hang for his crime? 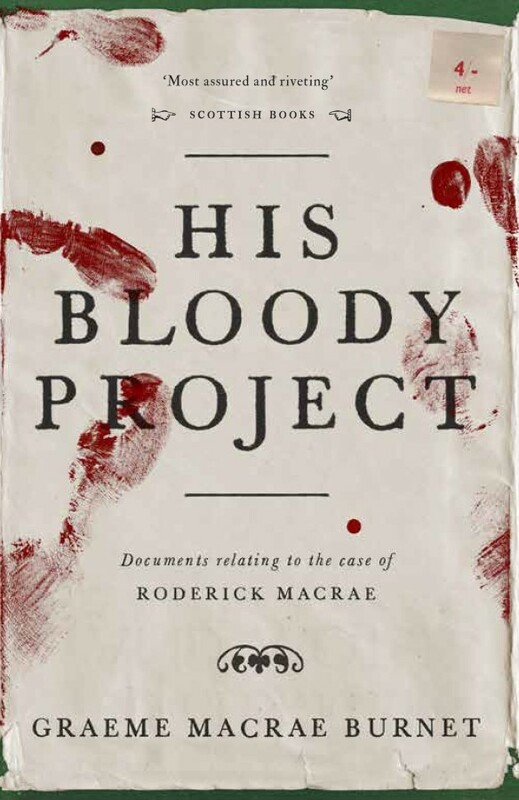 Presented as a collection of documents discovered by the author, His Bloody Project opens with a series of police statements taken from the villagers of Culdie, Ross-shire. They offer conflicting impressions of the accused; one interviewee recalls Macrae as a gentle and quiet child, while another details him as evil and wicked. Chief among the papers is Roderick Macrae’s own memoirs where he outlines the series of events leading up to the murder in eloquent and affectless prose. There follow medical reports, psychological evaluations, a courtroom transcript from the trial, and other documents that throw both Macrae’s motive and his sanity into question. Graeme Macrae Burnet’s multilayered narrative—centered around an unreliable narrator—will keep the reader guessing to the very end. His Bloody Project is a deeply imagined crime novel that is both thrilling and luridly entertaining from an exceptional new voice. The first paragraphs sucked me right in as Roderick (Roddy) Macrae freely confessed to the murders in an excerpt written while in jail awaiting trial. I immediately wanted to know why he committed these murders—or why he would confess if he hadn’t. I also was enthralled by the eloquence of the passage as Roddy, then 17-years-old, was presented in this first page as an uneducated farmer in mid-19th century Scotland. Roddy had also written an account of events leading up to the murders at the behest of his advocate, Mr. Sinclair. As we begin to read his tale, we come to suspect that our memoirist is not entirely trustworthy. In fact, I”m not sure our author (or narrator) is entirely trustworthy. The accused murderer and the author share a name (Macrae), which is suspicious enough. But in the preface, the author explains he was researching his grandfather’s life when he ‘came across’ the account of the triple murder. The author also doesn’t describe the novel as a “crime novel” but “a novel about a crime”, as the tale itself is woven through three ‘found’ texts—the aforementioned memoir, the psychiatrist’s account of the prisoner, and the newspaper reports on the trial. Even if Graeme Macrae Burnet made the whole thing up, his attention to detail and authentic voice was engrossing. It is these ersatz texts that the narrator presents as reality, but the attention to detail is what lends the novel such believe-ability. The portrait painted of the remote crofting (tenant farming) community of Culduie and of mid-19th century Scotland in general is rich with detail without indulging in poetic descriptions and scene setting. The opening accounts from the police investigators sets the scene of the story: a brutal triple-murder in a remote Scottish farming community, and a odd young man who has confessed to the crime. Thus follows a collection of documents, presented by the author as the case files and account of the prisoner and subsequent trial. The witness accounts of Roddy as a boy, his attitude following the murder, and observations of his character create a contradictory impression. Readers must sift through testimony and accounts, deciphering both the spoken and unspoken clues from other members of the community such as neighbours, the schoolteacher, co-workers, and the religious minister for the parish. As I was reading, I couldn’t decide if he was a borderline sociopath or just on the spectrum for Autism. What made me think of autism was his own account of his childhood—letting his older sister speak for him—as well as his schoolmaster’s description of his aptitude for learning while being removed from the other children. As Roddy describes his interactions with others in his community, particularly other young people, I thought perhaps he lacked the ability to interpret social cues, as is common with spectrum disorders. As we got to the details from the police and coroner reports, I had further doubts. We aren’t actually told the other two victims besides Lachlan Broad until quite far along in the story. But my doubts were sewn when I read the account of Flora Mackenzie’s injuries, which included trauma to her pelvic region. I thought maybe that the dismissive way these injuries were treated said something about the indifference of the law toward sexual crimes in the 1860s. While this may have been true to some effect, it was not the entire picture. Besides the crime drama, there are other elements that make His Bloody History a complex and engrossing read, including historical psychiatry, the father-son relationship, the abuse of power, pregnancy out of wedlock, the poverty of the tenant farmer in the 1860s, and the attitudes between city Scots and rural Highlanders. There is so much I could say about these various facets of the novel, even though these elements don’t take centre stage. I think that’s what makes the text so much richer; these aspects are part of rural life in the 1860s, creating a background atmosphere. The psychiatric knowledge of the 1800s was limited compared to modern standards, which Burnet explores in detail. The alienists (an archaic term for a psychiatrist or psychologist) are used as experts by both the Crown and the defence to try to portray the prisoner’s mental state. The experts—including a character based on an actual prison doctor from Perth named J.B. Thomson—use terms like “morally defective”, “hereditary criminal”, and “criminal classes” to describe these individuals. They used cranial measurements and other physiological observations, then common practices in the field of criminal anthropology. I think what made this text stick with me so much is how articulate and intelligent Roddy feels, while the rest of the character and village recount curious interactions. I could continue to analyze the legal logic and the case documents, but I don’t think I have the historical or legal expertise to pick apart all the intricacies. This “Catch-22 legal logic” is described by a Telegraph reviewer and “supposes someone displaying signs of insanity can only be a sane person dissembling to escape the hangman”.